Deck of 1000 Spreads: A Tip for Those Divining Spreads—And a New Reading Technique! A Tip for Those Divining Spreads—And a New Reading Technique! It seems like some people have luck with divining spreads—mixing all your Deck of 1000 Spreads cards together and choosing at random from a face-down pile—and some don't. It works pretty well for me. But for those of you left with a fistful of card positions that make no sense, FallynRaiyn over Aeclectic.net has a solution. After trying to divine spreads with little luck—too many topics and influences showing up and not enough outcomes—she tried something different. She went through the deck face up and started pulling out all the cards she'd like to see in a spread befitting her question. And she ended up with half the deck! So she took that half and chose from that! Actually she went further than that, but that tip alone is great for people who want the magic of divining a spread and the control of getting the kinds of spread positions that best apply to the topic. Simply go through your deck, pull out the positions that apply to your topic, then divine from them! Anyway, here's the reading technique that FallynRaiyn discovered/invented when she did this. 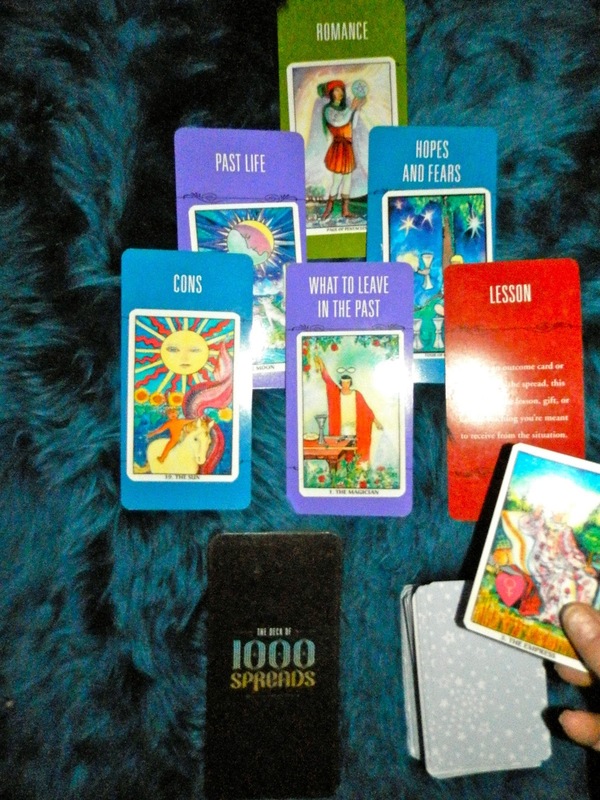 So she went through her Deck of 1000 Spreads and chose just the positions she wanted to know about. Then she shuffled those cards and placed them in a pile face down. Then she shuffled her tarot cards and placed them in a pile next to her spread cards. So you have two piles of cards...your desired spread cards, face down. And your shuffled tarot deck, face down. 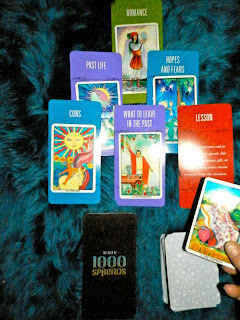 Then she turned over the top spread card and the top tarot card, pairing them. Then she chose the next spread card in the stack and the next tarot card...and so on. She configured her spread intuitively, in a pyramid-like position, reading each pair individually, as well as in the context of the spread she was creating. By the time she was done, she had gone through every card in her "preferred positions" stack and all her questions were answered. It created a monster spread, but she got an incredibly thorough read on her situation. She said "I've never been so satisfied with a reading".